Dr. Hani Salehi-Had is a vitreo-retinal surgeon specializing in the medical and surgical treatment of diseases of the retina, vitreous, and macula. He is a Harvard trained board certified ophthalmologist with formal fellowship training in the diagnosis and treatment of conditions of the eye including macular degeneration, diabetic retinopathy, and retinal detachment. Top Eye Surgeon, Dr. Salehi-Had graduated with departmental honors from the University of California, Berkeley with a degree in Biochemistry and Molecular Biology. While there he received the prestigious “Kazuo Gerald Yanaba & Ting Jung Memorial Fund Prize” for the top honors thesis in Biochemistry and Molecular Biology. Dr. Salehi-Had then attended medical school at the University of California, Davis School of Medicine where he was elected to the Alpha Omega Alpha (AΩA) Honor Medical Society and was awarded several honors including an academic merit award for scholastic excellence in ophthalmic research. After completing his internship at St. Mary’s Medical Center, Department of Internal Medicine in San Francisco, he went on to complete his ophthalmology residency at Harvard Medical School, Massachusetts Eye and Ear Infirmary. Thereafter, he completed a 2-year vitreo-retinal fellowship at the prestigious Doheny Eye Institute and LAC-USC Medical Center of the University of Southern California, Keck School of Medicine. 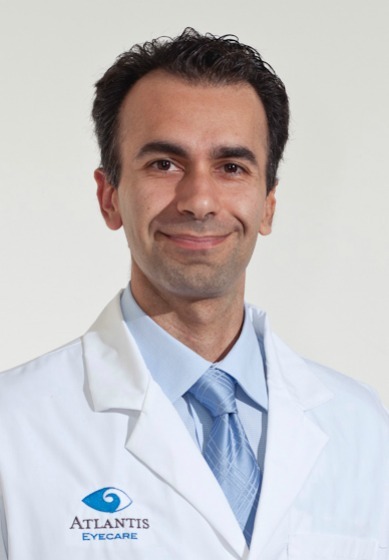 Dr. Salehi-Had is a member of the American Academy of Ophthalmology, American Society of Retina Specialists, and the Association for Research in Vision and Ophthalmology. He has been involved in several research studies on topics ranging from gene therapy for macular degeneration to surgical intervention in diabetic retinopathy and vitreo-retinal surgery in severe eye trauma. He has authored a number of peer-reviewed publications and has presented at multiple international research conferences. Dr. Salehi-Had is currently participating in several clinical trials offering the latest advances in medicine to his patients and helping to shape the future of vitreo-retinal disease and surgery. Dr. Salehi-Had is a top eye surgeon in Orange County at Atlantis Eye Care and operates out of our offices in Huntington Beach, San Pedro, and Torrance. And he performs surgery at multiple surgery centers and hospitals in Orange County and Los Angeles County. Dr. Salehi-Had enjoys spending time with his wife. His hobbies include playing soccer and tennis. He also enjoys hiking, skiing, and playing the piano. Dr. Salehi-Had is fluent in Farsi. Finding in Older Children With Abusive Head Injury: Does Shaken-Child Syndrome Exist? Dr. Salihi-Had is alway thorough and more than willing to answer any questions that I have. He is a very competent caring physician. Dr. Salehi-Had took time to write out personal instructions for my 80 yr old dad for his prescriptions. This was so helpful for my dad who struggles with auditory directions and memory issues when under pressure. My father, Reginald O'Neill, is Dr. Salehi-Had's patient. I appreciate the time, concern, and care he has given my Dad in the two recent surgeries he's performed--one to remove an eye buckle and other to re-attach his retina. Both the doctor and his staff members display the patience and compassion necessary to work with elderly clients with such caring respect. Thank you for your abilities to provide top-notch eye care and your desire to do it with noted integrity. All the staff handled my care in an excellent manner, very efficient, very pleasant, kudos to Dr. Salehi and his staff who have kept my vision alive and allowed me to be able to read, watch TV ect. I shall always be thankful to them. Dr. Salehi-Had was very informative on all may visits. He explained in detail on the procedure of the surgery. He was very positive on what he was going to do and what will happen after the surgery. During the pre-op everyone was helpful and there must have been at least 4 people asking me the same questions, medical allergies, what eye is going to be operated on, what kind of surgery,etc. Everyone was very informative on what was happening. I was quite comfortable. The best part was I was only 3 miles from the facility. After the surgery I had zero pain, zero pressure on my eye. Dr. Salehi-Had said it will be blurry for several days, and it was. There was no discomfort at all, besides wearing that plastic patch over the eye. In one week I was back in the water surfing. I want to thank Dr. Salehi-Had and staff and to you Vanessa for all the help you provided for me. Dr. Salehi is my hero. He worked hard on my left eye (2 hours in surgery), he eased my fears and concerns, explained everything (a fabulous specialist). I told him how great he was, I hope you tell him too. I work in the medical field its different being a patient. But I was impressed with the help and care I received from Dr. Salehi and Rosa. Dr. Salehi-Had was AWESOME! Everyone was very helpful, friendly, warm and professional. Even though they were all very busy (due to staffing shortage), they kept their cool, explained everything and kept me informed, and handled everything admirably. They may have been under duress, but they didn’t show it or convey it! A wonderful, well-trained staff doing a WONDERFUL JOB! Your staff has good chemistry and great bedside manner! Kudos A+++++! Thank you! I was a former patient of South Coast Retina, so I was not happy my insurance company (Talbert) would no longer be able to see Dr. McBeth, but after Dr. McBeth spoke to me I felt better. Dr. McBeth had great things to say about Dr. Salehi-Had. After seeing Dr. Salehi-Had I feel so much better and can't wait to see him again. Dr. Salehi has been fabulous...and his support staff outstanding. I feel they are all concerned for my well being...they are friendly, courteous and efficient and I would highly recommend this practice to friends and family. I don't know the names of all those who help me because I cannot see well enough, but I know I always feel cared for by all of them and always look forward to my visits with confidence that the visit will be a positive one. Very impressed of the overall care Dr. Salehi takes with you, talking to you explaining what is going on in your eyes. Not only the care given by doctor, medical assistant and office personnel but the encouragement given to me concerning my condition for the present and into the future. I was impress with Dr. Salehi's friendliness, knowledge, and candor. Great doctor! Very knowledgeable and professional. I would also like to praise the technician lady! She was also very nice and professional!